The ultimate gift for -aspiring- ballerinas, dancers, gymnasts, yogis, martial artists and basically any activity for which flexibility is an important factor. This Flexibility Pack features our 2 most popular products to improve flexibility, balance, strength and range of motion. Both products are suitable for any skill level and any age, although for the Stretching Band we recommend 4'9" or above for normal use (the band can be made shorter by tying a knot, which we explain and show in a video). ❗️IMPORTANT❗️ - this might not be a suitable gift in case of latex allergy. The Door Flexibility Trainer PRO is fine, but the Stretching Band is 100% natural latex. ❤️️ THE PERFECT GIFT - If you're loved one is passionate about ballet, dance, cheer, tumbling, pilates, yoga, martial arts or any other sport that requires flexibility, this will put a wide smile on their face and will help them move better than ever before! 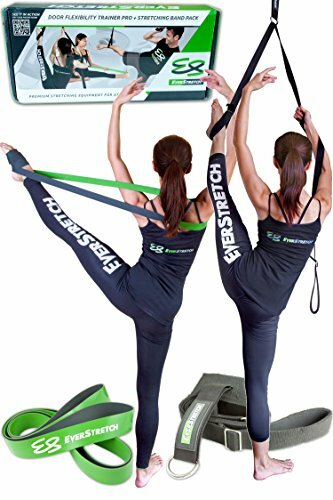 ✅ GREAT VALUE - This value pack is a combination of our 2 most popular flexibility training / stretching products and you save over 20% with this bundle. ☘️ OUR 100% SATISFACTION GUARANTEE - We have full confidence in our products, but what's even more important to us is that you are happy with them. If not; we'll work with you until your issue is resolved. Buy with confidence: Money back guarantee and free extended lifetime warranty (requires registration).